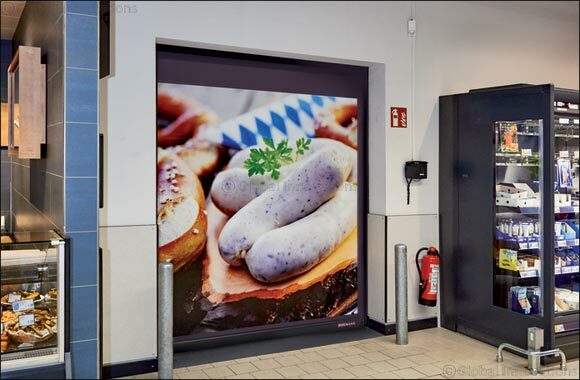 Dubai, UAE; September 06, 2018: Hormann, a leading provider of doors and gates in the region, has introduced V2012 - a specialized door for supermarkets. This fully equipped door is a safe internal door for commercial enterprises with high customer frequency. The door comes with an operator and shaft cover manufactured with standard light grille (monitoring height 350 mm) and automatic emergency opening via a counter weight. These features make the flexible plastic curtain door a safe choice for indoor areas with high customer footfall. It is also possible to print the curtain individually and customize it to match the interiors of the establishment. The door operates efficiently. It is suitable for indoor applications with a maximum height of 2500mm and maximum width of 2500mm. The opening speed can reach 1.2 m/s, and closing speed 0.5 m/s and is suitable for temperatures between 5° to 40° C. The fabric thickness of the curtain is 1.5mm and 2.0mm for the fully transparent curtain. The curtain is available in five different colors; zinc yellow, pure orange, carmine red, gentian blue and agate gray.